South Sudan is “back to war”, a spokesman for the vice-president has told the BBC, as rival factions clash and hundreds have been reported killed. Forces loyal to Vice-President Riek Machar say government troops attacked their positions in the capital, Juba. But Information Minister Michael Makuei Lueth said the reports of war were “dishonest”. 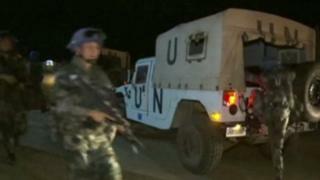 The UN mission said hundreds had sought shelter in its compounds, and called for leaders to restrain their troops. Col William Gatjiath, Mr Machar’s military spokesman, told the BBC President Salva Kiir “isn’t serious” about a peace agreement. He said “hundreds” of Mr Machar’s troops had died on Sunday, and that troops loyal to Mr Machar were advancing on Juba from different directions. Mr Lueth said government troops responded when Mr Machar’s forces attacked a checkpoint, adding that those forces had now been scattered. “The situation is normal and it is under full control,” he added. The clashes follow days of fighting in the world’s newest country between supporters of Mr Kiir and Mr Machar. At least 150 people were killed in fighting on Friday, before calm was restored on Saturday. Local radio station Radio Tamazuj reported on Sunday that the death toll from those clashes may be as high as 271. Why does S Sudan matter to much to the US? The violence has raised fears of renewed instability, with a 2015 peace deal failing to quell unrest. Heavy gunfire was reported on Sunday near a military barracks occupied by troops loyal to Mr Machar. Friday’s exchanges were apparently sparked by a shootout between Mr Kiir’s and Mr Machar’s bodyguards. The two men met at the presidential palace on Friday, and issued a call for calm. July 2011 - South Sudan becomes an independent country, after more than 20 years of guerrilla warfare, which claimed the lives of at least 1.5 million people and displaced more than four million. December 2013 - Civil war breaks out after President Salva Kiir sacks the cabinet and accuses Vice-President Riek Machar of planning a coup. The war is fought broadly between the country’s biggest ethnic groups – the Dinka, led by Mr Kiir, and the Nuer, under Mr Machar. More than 2.2 million people are displaced by the fighting. Famine puts the lives of thousands at risk. Tens of thousands of people are reported killed, and Mr Machar flees the country. August 2015 - President Kiir signs a peace deal with rebels after a threat of sanctions from the UN. April 2016 – Mr Machar returns to South Sudan to take up his job as first vice president in a new unity government led by President Kiir. The move marks “the end of the war and the return of peace and stability to South Sudan”, Mr Kiir says. The situation in South Sudan has echoes of the days before the civil war began, in December 2013, when skirmishes between troops loyal to Mr Kiir and Mr Machar escalated into a national bloodbath, killing tens of thousands and displacing two million. As artillery fire rings out in the capital Juba and a helicopter gunship buzzes overhead, desperate work is under way to try to calm the situation and to prevent the clashes from spreading. But huge distrust remains between Mr Kiir and Mr Machar and between their forces. The leaders may even be struggling to control their own troops. A number of peace deals have been signed – so far, none has led to lasting stability. One foreign worker in the Gudele district, on the outskirts of the city, told the BBC he was waiting to be evacuated from the area. He said shooting restarted at 08:00 local time (05:00 GMT) on Sunday, and had been sporadic throughout the day. The United Nations’ mission in South Sudan, Unmiss, said in a statement that hundreds of people had been forced to flee and seek protection in the organisation’s properties. It added that there were reports troops were blocking civilians from reaching shelter. Both its compounds in Juba had suffered damage, Unmiss said. The US embassy in Juba said that the situation in the capital had “significantly deteriorated“, and urged people not to leave their homes. South Sudan marked its fifth anniversary of independence from neighbouring Sudan on Saturday in lockdown. The country is so short of money that no official anniversary events were planned.